The seventh graders of Presentation School in Cheltenham meet with their kindergarten prayer partners. The kindergarten and seventh grade prayer partners from Presentation B.V.M. 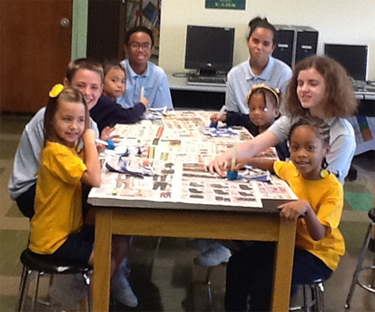 School, Cheltenham, met for the first time on the feast of the Guardian Angels, Oct. 2. As the children spent time getting to know each other, they decorated an angel for their prayer partner. The expressions on the faces of the kindergartners and seventh graders alike vouched for the success of the school-wide program. They plan to get together periodically during the school year to work on various fun and prayerful activities. Presentation B.V.M. School hopes the program will help to foster a positive spirit of helpfulness and Christian values.